Have a question for our experts? 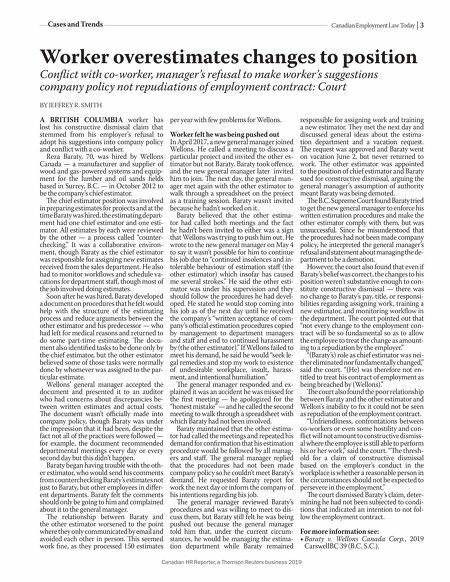 Email Jeffrey.R.Smith@thomsonreuters.com Canadian HR Reporter, a Thomson Reuters business 2019 2 | March 6, 2019 with Leah Schatz Ask an Expert MLT AIKINS LLP, SASKATOON Answer: An employer has a legitimate inter- est in ensuring that an employee discloses a prescription where there is a risk of impair- ment. Whether or not an employer has ful- fi lled its duty to accommodate will turn on a number of factors, including whether the employee works in a safety sensitive posi- tion, whether the employer has a drug policy, what it requires, and the circumstances sur- rounding the employee's dishonesty. e fact that the dismissed employee did not disclose his prescription was not a signifi - cant issue for the arbitrator in Airport Termi- nal Services Canadian Co. and Unifor, Local 2002 (Sehgal), Re. According to the arbitrator, who ordered reinstatement, once the em- ployer was aware of the worker's description it had both a procedural and substantive duty to attempt to accommodate the employee. e employee in worked in a safety sensitive position as a ramp agent and had tested posi- tive for marijuana after he was involved in a minor workplace accident. It was not until the day of the incident that he disclosed that he had been using medically prescribed mari- juana for the previous three years. According to the arbitrator in Airport Terminal Services, human rights legislation required the employer undertake an analy- sis into the worker's restrictions and limita- tions. However, because the zero-tolerance policy only contemplated accommodation for drug addiction disorders, it did not meet the employer's duty to accommodate an em- ployee authorized to use medical marijuana to treat a health disability. e arbitrator also found that the post-incident testing policy was unreasonable because it was drafted to mandate testing after every incident, includ- ing those that were not serious. e court in International Brotherhood of Electrical Workers, Local Union 1620 v. Lower Churchill Transmission Construction Employers' Association Inc. and Valard Con- struction LP, took a diff erent approach. A reviewing court upheld the arbitrator's con- clusion that the worker's failure to disclose his medical marijuana prescription was a discipline-worthy off ence. At issue in that case was also a zero-tolerance policy. However, unlike the drug policy in Airport Terminal Services, it did permit accommo- dation of medical marijuana prescription use. e reviewing judge in Lower Churchill agreed that the zero-tolerance drug policy was reasonable and rationally connected to the legitimate requirements of the safety- sensitive workplace. e policy in Lower Churchill also specifi cally required dis- closure, which was necessary in order for the employer to properly assess the type of accommodation that was needed and the potential impact that the accommodation could have on the workplace. Even if an employee deliberately conceals his prescribed medical marijuana use, an employer will still need to consider its duty to accommodate. is is not to say that an employer cannot treat non-disclosure as a discipline-worthy off ence. However, the policy at issue must expressly say that failure to disclose prescribed use of a potentially impairing medication could result in disci- pline. In order to avoid the same pitfalls as in Airport Terminal Services, an employer will want to ensure that its policy does not exclude a duty to accommodate disabilities requiring prescribed medical marijuana. An employer will also want to ensure that it has educated its workers on the mandatory dis- closure requirement. With respect to the duty to accommodate, the employer will need to objectively assess the requested accommodation against the nature of the employee's duties and work- place environment. As in Airport Terminal Services, once the employer is aware of the need for accommodation it will need to un- derstand the worker's restrictions and limi- tations, the daily and scheduled consump- tion of marijuana, the strain or strength of the marijuana, the safety sensitive nature of the workplace and the employer's obligation to ensure the safety of all workers in the work environment. is can be a challenging and time-consuming endeavor, but as the arbi- trator in Airport Terminal Services remind- ed, it is a necessary one. For more information see: • Airport Terminal Services Canadian Co. and Unifor, Local 2002 (Sehgal), Re, 2018 CarswellNat 991 (Can. Arb.). • International Brotherhood of Electri- cal Workers, Local Union 1620 v. Lower Churchill Transmission Construction Em- ployers' Association Inc. and Valard Con- struction LP, 2016 NLTD (G) 192 (N.L. T.D.). Leah Schatz is a partner with MLT Aikins LLP in Saskatoon. She can be reached at (306) 975-7144 or lschatz@mltaikins.com. 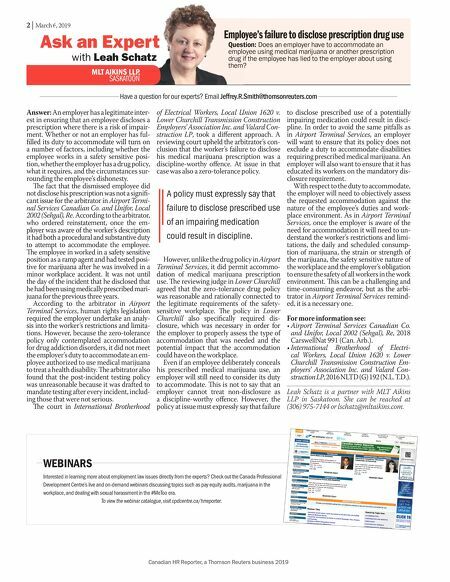 Canadian HR Reporter, a Thomson Reuters business 2019 A policy must expressly say that failure to disclose prescribed use of an impairing medication could result in discipline. Employee's failure to disclose prescription drug use Question: Does an employer have to accommodate an employee using medical marijuana or another prescription drug if the employee has lied to the employer about using them? WEBINARS Interested in learning more about employment law issues directly from the experts? Check out the Canada Professional Development Centre's live and on-demand webinars discussing topics such as pay equity audits, marijuana in the workplace, and dealing with sexual harassment in the #MeToo era. To view the webinar catalogue, visit cpdcentre.ca/hrreporter.